One of the most recommended pool filters for above ground pools is the Intex 2500 GPH Krystal Clear Cartridge Filter Pump. This pump earns praise for its efficient operation and economical price. As for the filter cartridge size, this model uses B filters. Also known as Model 28633EG, this pump is a major improvement over smaller capacity cartridge filter pumps included with many above ground pool kits. This particular model is rated for 2,500 gallons per hour and can easily handle the filtration needs of pools with up to 15,200 gallons of water. The manufacturer suggests a minimum of 4,000 gallons of water to operate this pool pump. Reviewers frequently praise the pump for its ability to keep pool water clear and lament the fact that this pool pump isn’t included with more Intex above ground pool kits. Many people recommend upgrading to this pool pump for most any sized above ground pool. Keep in mind though that you will likely need hose adaptors if you’re going from a low flow pump system (of about 1,000 GPH or less) to this more robust pump. This pump doesn’t include hose adaptors or plunger valves. Even with a good pool filter, it's a smart idea to invest in a pool cleaner as well. Check out our guide to the best pool cleaners on the market. While it’s no secret that the costs of maintaining a pool can start to add up, there are capable, budget pool filter pumps. One of the most popular picks is the Intex 1,000 GPH Easy Set Pool Cartridge Filter Pump System. This budget pool filter uses widely available filter cartridges. It’s designed to keep up with the needs of above ground pools up to 16-feet in size. 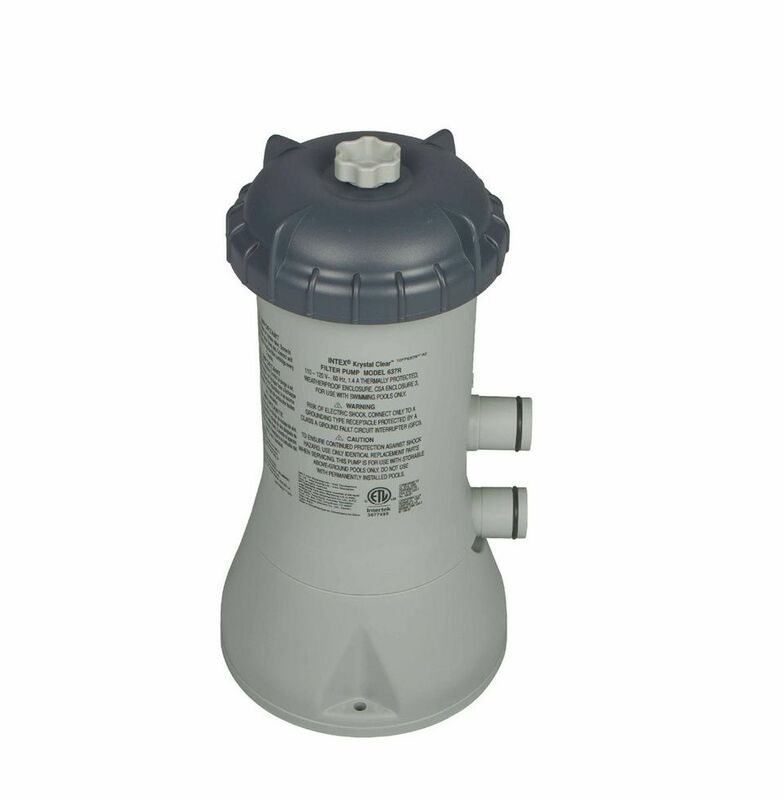 And while this budget pool filter pump is often bundled with Intex Easy Set and Ultra Frame pools, it can be used with any above ground pool that has 1.25 diameter hose connections. Everything you need for installation—hoses, fittings, and clamps—is included for the under-$50 price tag. While some people are major advocates for upgrading from this basic pool pump, the Intex budget pool pumps have been used with wide success in many backyard pools. It makes an affordable option if you need a pool pump for seasonal use and don’t want to spend a fortune. One of the most popular cartridge pool filters is the Hayward C1200 SwimClear Plus. Hayward is a top name in pool supplies, and this model is well-equipped to filter above ground or in-ground pools up to 36,000 gallons in size. The Hayward C1200 SwimClear Plus offers 75 feet square feet of filtration media, though different size SwimClear Plus pool filters are available if you need an increased capacity pool filter. The advantage to a cartridge pool filter is the fact that you won’t need to backwash the filter like you would with a DE pool filter. In fact, a number of people switched to this filter from DE or sand pool filters and were very impressed with this cartridge pool filter’s cleaning abilities. One thing to keep in mind is that this Hayward pool filter is housed in a plastic body. The sun can take a toll and cause the plastic to become brittle, so users advise that you cover it if the pool filter is in direct sun. One suggestion is to use a 5-gallon bucket to shield the housing. Another suggestion for the use of this pool filter is to keep a few filter cartridges on hand so that you always have a clean and dry one ready to go—resulting in no downtime during filter maintenance. A sand pool filter requires little ongoing maintenance or cleaning to keep your pool water sparkling. The Intex Krystal Clear Sand Filter Pump is a versatile choice if you want to use this natural filter media for your pool. The Krystal Clear Sand Filter Pump relies on the abrasive nature of sand media to trap particles that would otherwise float and thrive in your pool water. The pump itself has a 6-function control valve that lets you set the pump to filter, backwash and rinse, recirculate, or drain the system. With an included 24-hour timer, this pump operates with relatively little need for user intervention. It will require occasional backwashing (indicated by the pressure gauge) and the sand will need to be replaced about every 5 years. The 1,200 GPH pump flow rate is enough to keep pools up to 16 feet in diameter (or 8,400 gallons) clean and clear. Users of this pump frequently mention how they wish they would’ve switched to this pump sooner since it offers such easy maintenance for the pool and even backwashing is a simple operation. A sand pump is a perfect match for a low-maintenance saltwater pool, and this Intex pump and saltwater system is the perfect way to set up for your pool for easy summer fun. The Intex Krystal Clear Sand Filter Pump & Saltwater System is made for pools with a capacity of 2,600 to 8,500 gallons of water. This is only an above-ground filter and pump saltwater system, so you’ll need to look at other options if you want to convert an in-ground pool. People that have used this Intex filter system for a saltwater pool love how crystal clear their water is and how simple the maintenance program is. The pump is equipped with a 24-hour timer that runs automated programs for easy operation. The saltwater system reduces chemical use and requires far less hands-on chemical correction to keep the pool clean and sanitary, according to users. Diatomaceous Earth (DE) is another option for keeping your pool water clean. DE pool filters have the advantage of removing the smallest particles from the water—as tiny as 2 microns. If you're looking for a more thorough method of cleaning, check out the Hayward Perflex DE Pool Filter. The Perflex DE Pool filter is available with varying sizes of DE grids inside. The 20 square foot model is suitably sized for many residential pools, though your needs may call for a model larger or smaller. Inside the sturdy tank is a grid coated in DE that the pump passes pool water through. The DE holds onto particles as small as 2 microns, leaving little to pass through except for clean water molecules. To put that in perspective, the average human hair is about 50 microns—so we’re talking about bacteria, microbes, algae and more that are too small to even be spotted. DE pool filters do require some work—they’ll need to be backwashed periodically if the pressure becomes high due to retained particles. The Perflex model is known as a ‘bump DE filter,’ meaning it has a handle that helps clear any dirt and DE from the tubing. While they do a superior job of cleaning, some people have concerns over the health risks of DE. It’s advisable to wear a mask and gloves when working with the powder. Keep in mind, though, that with a normally functioning pump, the DE will be safely housed inside the pool pump and won’t be passing through into your pool water. If you only need a small pump for a small pool, then why pay more for the greater capacity you’ll never use? This has been the reasoning of many satisfied customers who purchased the Intex Krystal Clear Cartridge Filter Pump. Rated to move 330 GPH, this small pool pump works well for pools up to 1,018 gallons—or about 10’ in diameter. Many people with positive things to say used this pump on pools in the 6 to 8-foot range, though some users were successfully using it on pools up to 12 feet. Upon installation, you’ll be happy to see that this Intex Krystal Clear Pump includes all the necessary hoses and fittings to operate the pump successfully. Take note of the fact that this pump isn’t equipped with a timer. There are some people who suggest that you size up to the 1,000 GPH Intex pool pump, but if you truly have a small pool to clean, then this small pump will fit the bill. If you have an in-ground pool and need an energy-efficient but capable pool pump, check out the Pentair IntelliFlo Variable High-Performance Pool Pump. Unlike many other pool pumps, this advanced pool pump for in-ground pools offers variable speeds that match the demands of your pool configuration. This avoids wasted energy and doesn’t tax the pump filter by forcing water through at high speeds. It can handle the everyday maintenance needs of the water, but it will also keep up if you have jets, waterfalls, and more. This pump is pricey, but it is EnergyStar rated, so you’ll be gaining energy savings in return for upgrading your in-ground pool pump.